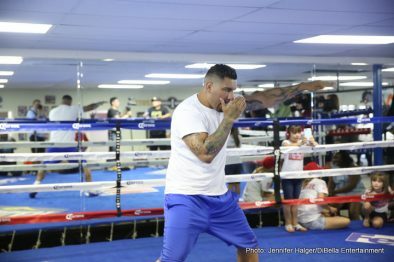 Heavyweight world champion Deontay Wilder, two-time heavyweight title challenger Chris Arreola, undefeated welterweight Sammy Vasquez Jr. and Olympic Gold medalist Felix Diaz participated in a media workout Wednesday as they near their respective Premier Boxing Champions on FOX and FOX Deportes matchups taking place Saturday, July 16 from Legacy Arena in Birmingham, Alabama. Televised coverage begins at 8 p.m. ET/5 p.m. PT and features unbeaten rising star Erickson Lubin battling once beaten brawler Ivan Montero in addition to the Wilder vs. Arreola and Vasquez Jr. vs. Diaz bout. The televised action will switch over to FS1 and FOX Deportes immediately following the conclusion of the FOX telecast. 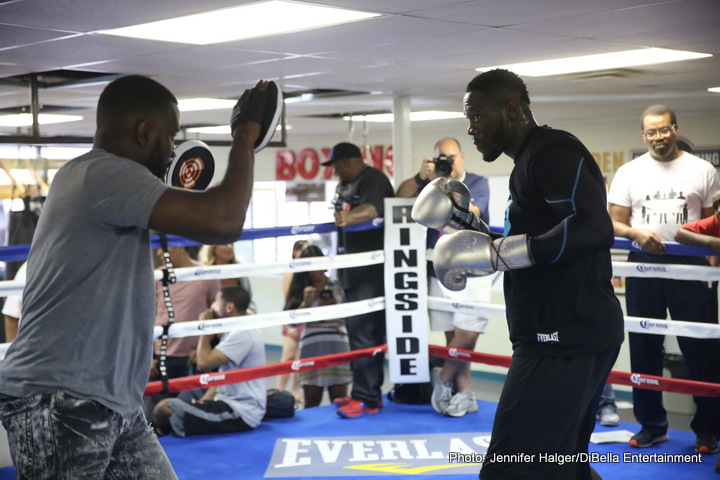 The fighters worked out at Round 1 Boxing in Vestavia Hills, Alabama as they prepare for the card headlined by the hometown favorite, Wilder, making the fourth defense of his heavyweight title. 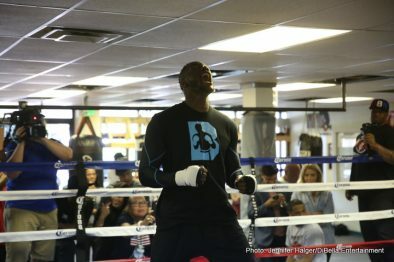 “When it comes to Deontay Wilder, people look for the knockouts and I deliver. What separates me from other heavyweights is the fashion in which I knock guys out. I don’t just knock you out, I really put you out. 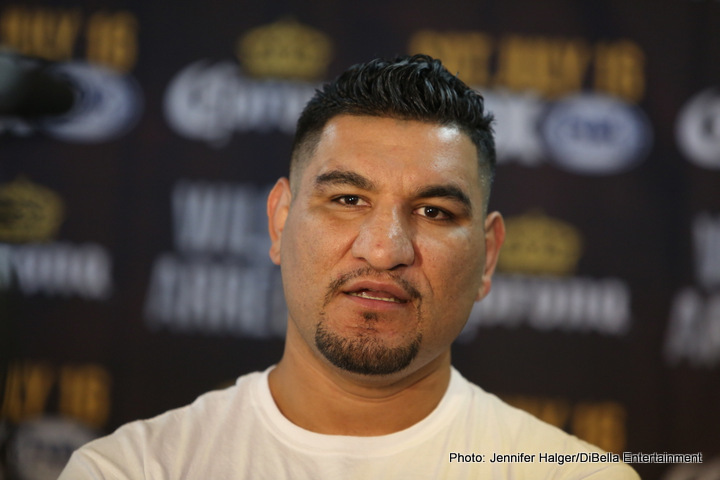 “Arreola definitely has a style prone to a knockout. He’s a pressure fighter who will come forward all night. That plays to my style. I love pressure fighters who give me a challenge. They keep me moving and thinking. I love the sweet science and the art to it. “I never look at films of opponents because I want to be surprised and I want to give myself a mental challenge in there. That’s what makes this sport so great. “Birmingham has showed me love from day one. I don’t just represent my city; I represent the state. Everywhere is my home. Birmingham understands entertainment and excitement and that’s what I’m trying to bring to people here. “I’m here to defend my title against a very hungry fighter. It’s a life-changing event for the man who holds the belt at the end of the night. “I never look past anybody. But I can look through them. Before I became a champion, I said I wanted to be an active champion. Just like I was active coming up. This has been my longest time away from the ring, so if all goes well on Saturday, I want to be back in the next few months. “I have an ability to get out of bed and fight. I can do things that regular fighters can’t do. I don’t do miles of roadwork. I’m blessed with stamina. 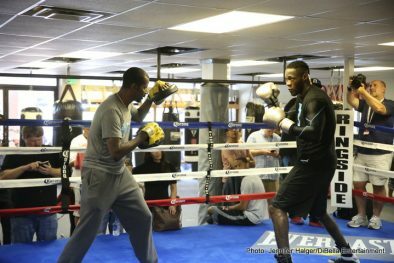 “Deontay is a very tough opponent so I have to come hard this time. This is my third world title shot and I have to make it count. The first time I was too young, the second time I got caught with a shot, but this time I’ll be ready for anything. “Fighting a guy like Wilder, I have to be ready for anything. But he has to be ready too. I’m no slouch. I have fire and he’s another person in my way. I’m here to get it. “There’s no challenge to get ready for a fight. I’m a boxer. This is what I do and this is what I love to do. Boxing is the most gentlemanly sport there is. You beat each other up then you shake hands like nothing happened. I’ve been grinding every day in the gym for this. “This is a big night for both of us. It’s a great opportunity to be on primetime television. People are going to be watching for free at sports bars and it puts us out there. They’re going to watch two big men on display going for it all. “I took it one day at a time in camp. I had to grind and get better every single day. I fear no man. I respect the man, but I don’t fear him. Everybody knows that I fight coming forward. I have to be smart and I have to move in angles. “I want to leave a legacy behind. 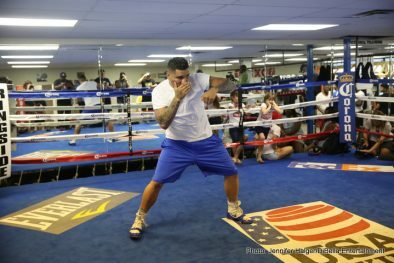 When they talk about Chris Arreola, they’re going to say ‘he did it.’ I took the long road but here we are now. “I expect him to have a lot of fans and he’s very deserving of that. He’s made things happen in this state and this state is lucky to have a fighter like him. But no one can get in there with him. The fans can’t fight for him. I love the fans, but they’re just there to watch. It’s just me and Wilder in there Saturday. 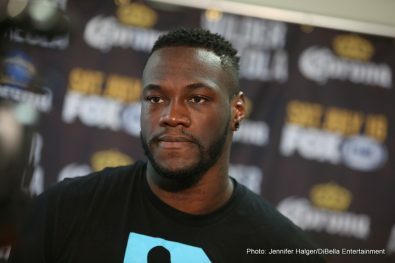 “Beating Bermane Stiverne and defending the title how he has, I definitely respect Deontay. 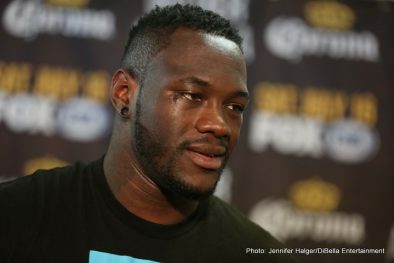 The humility that Deontay has shown has been impressive. He was more brash coming up the rankings and flamboyant. Now he’s come into his own and he understands who he is. “The biggest difference between now and earlier in my career is that I’m comfortable with myself. My main motivation is being a boxer. I’m a boxer first. It’s not about who has the better six-pack. “I think this fight goes eight rounds at the most. It’s tough to predict and he’s a shifty guy but I’m confident. I’m going to key in on the body and try to wear him out. I’ll be smart about it, because I have to make a statement in this fight. “My reach and my height will give me an advantage but he’s a slick fighter. All of these things can be advantages, but they can also work against you. I like to box and keep my opponent at range. I can’t let him smother me. We’re very prepared for his best shots. “I think it’s going to be a great fight. He has a great amateur pedigree but I think I’ve made more impact as a pro. We’re equals and it’ll make for an explosive fight. 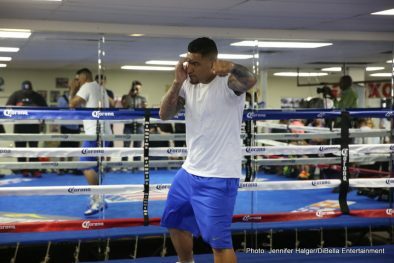 “Diaz is a slick southpaw, just like Luis Collazo. He’s had a couple decent names on his resume. I think Lamont Peterson fell into Diaz’s trap a little bit, which made that a close fight. He’s coming up to my weight, but he brings it and he’s dangerous. “It feels good to be here. It’s been a long training camp leading up to an unbelievable card like this. I’m very grateful for the opportunity to be here. My coach (Charles Leverette) is from Alabama and he represents the state hard, so I’ve been on the ‘Roll Tide’ bandwagon. “Sammy is a very good opponent of course. He’s undefeated right now, but he won’t be after Saturday. “Moving up to 147 is going to be great for me and allow me to be at my very best. I think I can do big things in this division and Saturday night will be the start. “What you train for and what happens in the ring are two different things. I’m prepared for anything that could happen in the ring. “I have a great team and training camp has gone very well. I’ve been ready to fight for a long time and I can’t wait to get in the ring. This will be the 1,937th fight sanctioned by the WBC in its 53-year history. 23 heavyweight world champions have been recognized by the WBC, five of whom have regained the title: Muhammad Ali (US), Mike Tyson (US), Lennox Lewis two times (GB), Hasim Rahman (US), Vitali Klitschko (Ukraine). 139 heavyweight world championship fights have been held in WBC history. This will be the third WBC heavyweight world championship fight held in Alabama in WBC history. Dec. 10, 1968 Joe Frazier W15 Oscar Bonavena – Philadelphia.